The iOS 12.2 beta, which was seeded to developers this morning, includes a hidden setup screen that confirms Apple's work on a new version of the AirPods with a "Hey Siri" feature. The new setup screen, which was uncovered by 9to5Mac, indicates AirPods users will be able to activate Siri with a "Hey Siri" command. The currently available AirPods do not support "Hey Siri" functionality, and rumors have suggested Apple is working on a second-generation version. When the second-generation AirPods are available, users will be asked to set up the "Hey Siri" feature when pairing the AirPods to an iOS device for the first time. With "Hey Siri" activated, AirPods users will be able to ask Siri questions without the need to tap on the earphones. Rumors of second-generation AirPods have been circulating for some time, and "Hey Siri" functionality has been an expected feature. Apple itself showed off "Hey Siri" capabilities on the AirPods during the introduction to its September 2018 keynote event introducing new iPhones. 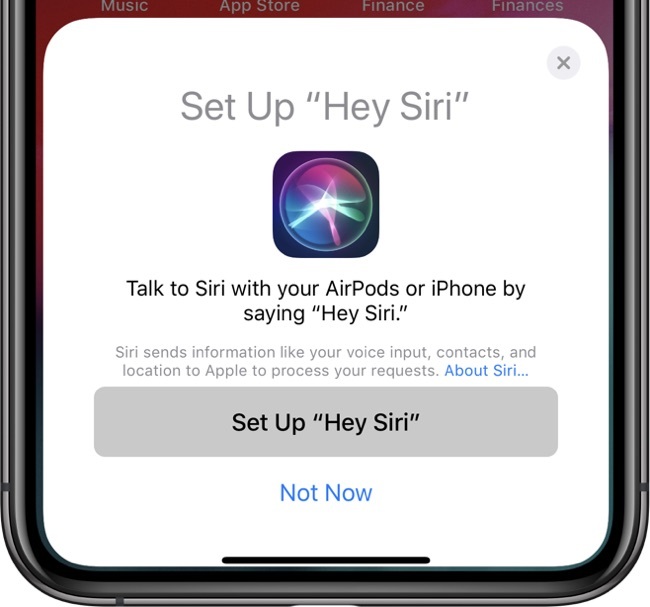 The inclusion of the "Hey Siri" setup menu in iOS 12.2 perhaps suggests that we're nearing the release of second-generation AirPods. We've also been expecting second-generation AirPods to feature a wireless charging case to be used with the AirPower, and the delay of the AirPower has presumably led to the delay of the new AirPods. It's not clear if Apple is planning to release an AirPods update without the AirPower, but in recent weeks, we've heard rumors suggesting the AirPower is finally being manufactured, which means we could see a release in the next few months. Yesterday, a new AirPods rumor from DigiTimes suggested Apple would introduce next-generation AirPods with an unspecified "health monitoring" feature during the first half of 2019. Whatever health functionality DigiTimes is talking about could be included alongside wireless charging and the confirmed "Hey Siri" feature. Reliable Apple analyst Ming-Chi Kuo has also said that we can expect new AirPods to be released in early 2019. Wish they could be setup to say "hey google!" to avoid getting the "I can't do that yet"
Not me. Would rather a Google not track my every move and instead use a very capable Siri for most things. The old tired narrative of Siri being terrible needs to be re-evaluated and updated with new facts. There was a study recently where Siri performed better than Alexa and Cortana and was MUCH improvement over the last year. In an 800 question test, Google Assistant was able to answer 88% of the questions correctly vs. Siri at 75%, Alexa at 73%, and Cortana at 63%. Last year, Google Assistant was able to answer 81% correctly vs. Siri at 52%, Alexa at 64%, and Cortana at 56%. So if the first gen have the w1 chip, couldn’t this be added with an update to the existing AirPods? Ha of course they could but, will they? Most likely not. Hey Siri, Airpods need noise cancellation and volume control. Is there a source claiming next generation AirPods will also have the W1 chip? I just assumed gen 2 would feature something like a W2 for health monitoring and Hey Siri. EDIT: Question answered here ('https://forums.macrumors.com/goto/post?id=27031199#post-27031199'). I love my AirPods, best product Apple has released in years. But I’d need a lot more than just Hey Siri to upgrade to gen 2. Don’t need or want the health tracking, but waterproof would be great. Why would it? It’ll obviously have the same port as the iPhone, since most owners will be using them with their iPhone anyway. [doublepost=1548372755][/doublepost]Since these beta cycles usually last 2 months, I’m guessing Airpods 2 will launch alongside AirPower and iOS 12.2 in March. I wish they’d offer AirPods 2 in some more color options. Fingers crossed for that. Hope they will introduce "pairing/locking" AirPods with iCloud account - could provide some way to inform "new owner" how to return them back to the rightful owner.